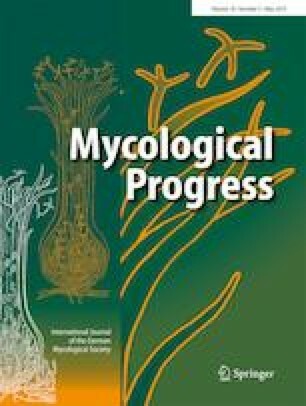 We introduce three new Phylloporus species, P. pusillus, P. subbacillisporus and P. subrubeolus, from southwestern China and northern Thailand with macro- and micro-descriptions and illustrations. They are found mostly in forests dominated by Fagaceae or Dipterocarpaceae trees. A three-gene phylogenetic analysis of the new Phylloporus species along with other selected Phylloporus species confirmed that all new Phylloporus species are related to previously described Phylloporus species. Phylloporus pusillus and P. subrubeolus are morphologically similar, but the former can be separated by very small basidiomata, lamellae becoming deeper yellow to reddish with age and less densely encrusted walls of pileipellis hyphae. Phylloporus subbacillisporus can be easily distinguished from other species by shallowly intervenose lamellae and subbacilliform basidiospores. The authors are grateful to Wim Baert and Myriam de Haan for their help in the laboratory. OR is also grateful to the National Research Council of Thailand for permission to conduct research in Thailand. Santhiti Vadthanarat, Saisamorn Lumyong, and OR acknowledge the National Parks authorities for granting the permit for collecting in Doi Suthep-Pui National Park. The Curators of the University of Vienna herbarium (WU), the Herbarium of Cryptogams, Kunming Institute of Botany, Academia Sinica (HKAS), and Roy Halling (NY) are acknowledged for the loan of specimens. The two anonymous reviewers are also acknowledged for their useful comments. Financial support was from the Research and Researchers for Industries grant (PHD57I0015) to Boontiya Chuankid and Olivier Raspé (OR). Thailand Research Fund also provided funding (Research Team Association grant 5880006) to Saisamorn Lumyong and OR.